The Malvern PANalytical Alpha-1 is a high resolution instrument that generates a monochromated beam of x-rays, directs them towards a sample, and then collects the diffracted x-rays. Plotting the detected x-ray signal as a function of the incident or diffracted angle gives data that lead to a precise determination of the spacing and positions of atoms in the sample. To reserve time or request training on this tool, click here or on the image at left to go to the Alpha-1 tool page on SUMS. These are all SiO2. Though chemically identical, the atoms are aligned differently and each phase produces a different pattern. Complex multi-phase powders can be identified. 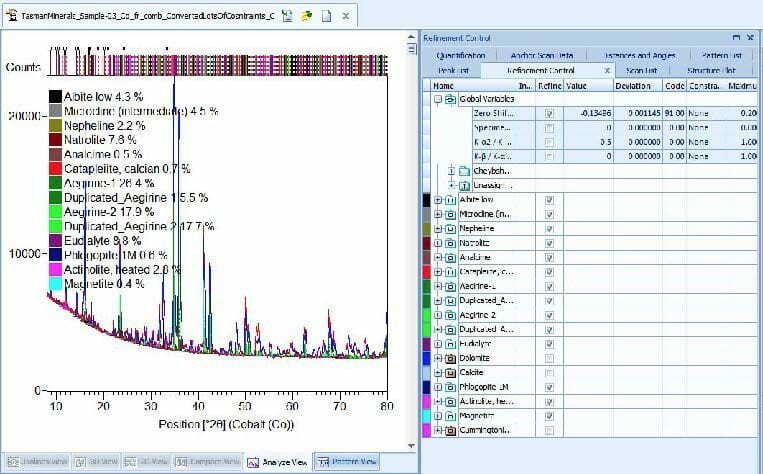 Data analysis is performed using HighScore Plus provided by PANalytical using PDF 4+ Database from ICDD. The Alpha-1 has a monochromator that strips the K-alpha 2 peak leaving behind only K-alpha-1 for ease of analysis. 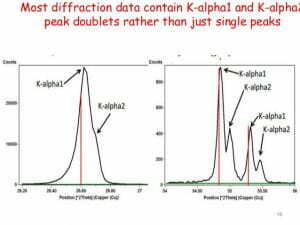 Only Kα radiation is directed to the sample and collected, creating very clean data without any confusion caused by Kα2 or Kβ peaks. A key component of diffraction is the angle between the incident and the diffracted beam. All x-ray diffraction systems have three components. 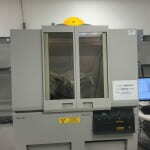 An x-ray source, sample holder stage, and a detector. 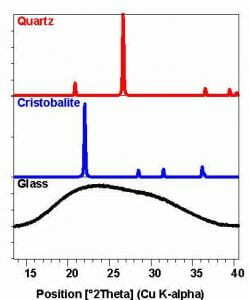 There are a number of commercially available sources with various properties and wavelengths, the Alpha-1 has a copper anode with a Kα of 1.54184 Å. Sample Size: For powders, we have have a number of back-filled powder holders available in 16mm and 27mm size as well as zero background holders.